Midi file is a well-known format for playing music. It’s very easy to find a lot of varied music often for free on the web. http://www.midiworld.com Midi World is a huge free Midi site with varied genre : classic, pop, rock, rap, dance, punk, blues, country, movie themes, tv themes, Christmas carols, video game themes, disney themes, national anthems, jazz , hip-hop. https://freemidi.org Free Midi is also huge free midi site with varied genre : Rock, Pop, Rap, Hip-Hop, R&B, Soul, Classical, Country Folk, Jazz, Blues, Dance / Electric, Folk, Punk, New age. https://www.vgmusic.com Huge library of Midi video game. Started in 1996, thousands Midi files are available. Click on button “Add Midi File” to add a Midi File (filename of type .mid) from your computer to Midi Player Tool Kit. You can also directly imports a group of midi files in your project : from the file explorer of your computer, copy Midi files into folders MidiPlayer\Assets\MidiPlayer\Resources\MidiDB. 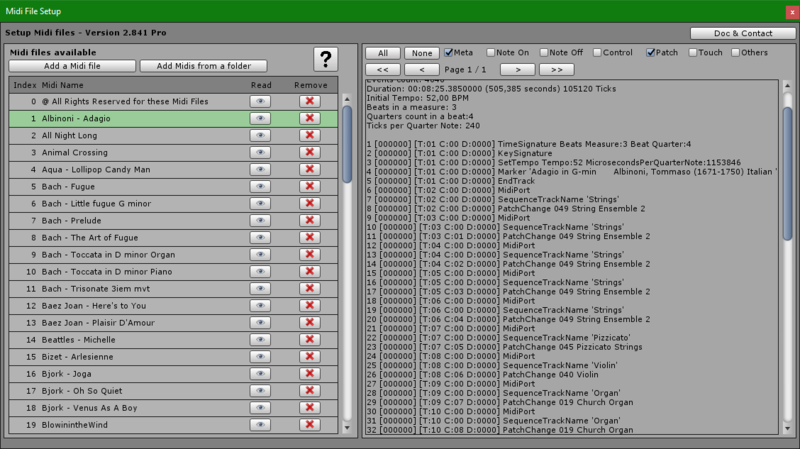 Next, you have to go to menu Tools and “Midi Player Tool Kit” to automatically add these new Midi files. Don’t forget to ask authorization for copyrighted resources!